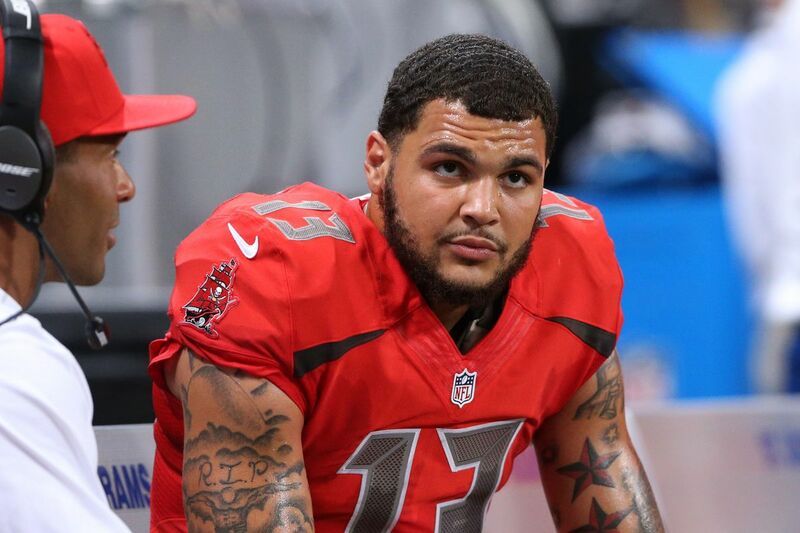 An exceptional wide receiver, Mike Evans has won several titles in the history of football both as an individual and together with his teammates. The NFL star might not be the most popular footballer in this era but his stellar achievements on the field speak volumes. A man of many talents, Evans is not just a top-notch football star but also a superlative basketball player. His journey to stardom is such an interesting one and we are super excited to share it with you. Keep reading to find out how it all started and how he has been making the most out of his useful life. Mike’s parents, Heather Kilgore (mother) and Mike Evans Jr. (father) welcomed him into the world on the 21st day of August 1993, in Galveston, Texas, in the United States. His nationality is American but his ethnicity is not known to the public. Born Mike Lynn Evans, the footballer has a younger sister whose name is yet to be publicized. However, her Instagram account username is bad_kitty23. The NFL player studied at Ball High School in Galveston, where he began playing organized football and basketball and competing in track and field. In his senior year, Mike initially devoted his time to basketball, averaging 8.4 rebounds, 5.2 assists, and 18.3 points. He switched to football in the same year, gaining seven touchdowns and 25 receptions for 648 yards. This feat earned him a second-team District 24-4A honors. The footballer also competed in track & field for his school, especially jumping. He was part of his school’s the 4 × 100m and 4 × 200m relay squads and also recorded a personal-best leap of 6.28 meters in the long jump and 14.11 meters in the triple jump. Following his graduation from high school, Evans decided to further his education at Texas A&M University, where he eventually represented the Texas A&M Aggies football team in the league for three years (2011 to 2013). As a freshman, he recorded five touchdowns as well as 82 receptions for 1,105 yards and five touchdowns, earning himself freshman All-SEC honors from the league’s coaches. His appearance in the 2013 season also produced good results which paved way for him to win more accolades. He completed the season with 12 touchdowns and 69 receptions for 1,394 yards. The footballer launched his professional career in the year 2014 after he announced on January 2, 2014, that he has decided to relinquish his final two seasons of his collegiate eligibility. Evans eventually entered the 2014 NFL Draft and was selected with the seventh overall pick in the first round by the Tampa Bay Buccaneers. He completed his third season with the Florida-based football team with 12 touchdowns in sixteen starts and 96 receptions for 1,321 receiving yards. This led the Buccaneers to select the fifth-year option on his contract on April 17, 2017. Mike recently signed a five-year contract extension worth $82.5 million with the Tampa Bay Buccaneers. The deal, which was sealed on March 9, 2018, came with $55 million guaranteed. As mentioned earlier, the name of Mike’s dad is Mike Evans Jr. He was married to his mother Heather Kilgore until the day Sam Kilgore (Heather’s brother and Mike’s uncle) killed him. The incident took place when Mike was nine years old. The footballer shared that his uncle killed his father in their Galveston home while he was babysitting him and his sister. Sam allegedly stabbed and killed Evans for severally beating his sister. Heather was subjected to domestic violence by her husband for so many years. Sam only learned about her plight when he went to live with Mike’s parents. It was in the course of his stay that he watched Mickey punch a beer can into sister’s mouth, shattering her lip. He was jailed only for 30 days but Sam kept his plans to himself until the night he revenged and killed his brother-in-law. Talking about Buccanneers star’s brother, he has one biological sibling, which is his sister. However, he considers and addresses American basketball player Terran Petteway as his brother. Also born in Galveston, Texas, Petteway has been friends with Evans from childhood. Born on October 8, 1992, Petteway represents the Dinamo Sassari in the Italian Lega Basket Serie A. His Wife – Who Is She? Mike Evans is married to Ashli Dotson. The pair tied the knot in 2016 and welcomed their first baby together on November 2016. Her name is Ariah Lynn Evans. The Evans empire also accommodates another beautiful girl called Mackenzie Evans. She is Mike’s older daughter who came from a previous relationship. Evans is blessed with a good athletic build and height which compliments his impeccable personality. His body weighs 105 kilograms, which is equivalent to 231 lb while his height is measured to be 1.96 meters, which is 6 feet 5 inches.